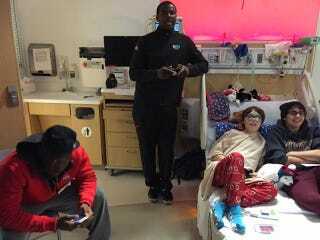 Back in January, Ohio State quarterback Cardale Jones visited some kids at the hospital. One of the kids unwisely hopped on the sticks like Jones was going to take it easy on him in the NCAA football video game. Jones did not take it easy, and beat the kid by a reported score of 91-35. Now, more than a month later, Jones wants us to know what really happened that day. Can't blame him for wanting to ensure the accuracy of the historical record.